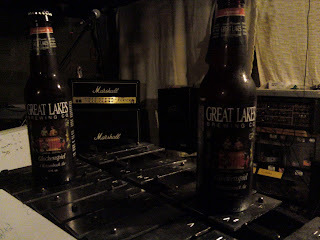 Since the discontinuation of Moondog ESB and Holy Moses White Ale, Great Lakes Brewing Co. (GLBC) has introduced two new brews to the masses, Grassroots Ale (a siason) and Glockenspiel (a weizenbock.) Grassroots did not catch our hearts like Holy Moses or Moondog so we had high hopes that Glockenspiel, 12 oz bottles sold in a four-pack, would deliver us for mediocracy. With us today is our good friends as well as our part-time beer blog collaborators, Nick and Jason (aka J-Glock,) to give their spiels as well. Glockenspiel chimes in at 8% ABV and pours a copper color with Jello brand banana pudding smell. With its full body mouth feel, this GLBC beverage hits the oral orifice with citrus-y hops and spices dancing on the tip of the tongue. The brew starts out bitter then becomes sour. As it swims down your throat, you are left with a sweet banana aftertaste with hints of clove and fig. This is not an everyday brew, as it would best pair with bratwurst and other sausages than by itself. Compared to the other big brew four packs by GLBC, we would not drink this until we blacked out, nor would be stock it in a vampire's cellar. It does however, mow the grass of the fore mentioned farmhouse ale. It promises hell's bells, but all we are left with is some Australian band that only knows four chords and one drum beat.